Beautiful Thai Silk Scarf. Colour goes from brown to gold to cream. Meausres 25.5" x 64". Dispatched with Royal Mail 2nd Class. There Are Multicolour Embroidered Circle All Over The Dupatta Which Gives A stylish And Heavy Look to These Ethnic Indian Dupatta / Stoles. Zaributi Pure Nazneen Chiffon Embroidered Dupatta with Multicolor Pom Pom Lace. Our unique quality you will not disappointed. Beautiful Scarf Made of 100%, Silk. This Super soft and Luxurious silk scarf is Trendy and really fashionable. Feature luxury soft feeling silk, easily make your eye-catching on any outfit. 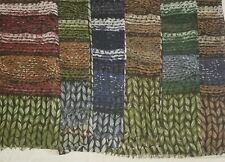 Women PALAK Scarf - Multicolour This was an unwanted present. I am having a clearance and also saving money for my wedding- please have a look at my other items too. From a smoke and pet free home. Any questions please ask. Light as a feather pure silk long rectangular scarf. Brand new and hand made in India. Beautiful orange border to blue/pink multi-colour elephant pattern. Sewn in label confirms 100% silk and Indian origin. Hand wash separately. Do not tumble dry. Iron on silk setting. 51 cms or 20" wide x 168cms or 66" long. 100% Silk Scarf with screen printed Multicoloured Star design. Designed by Stuart Morris Textiles. Thai Multicoloured Elephant Print Sarong. Measures 73" by 42" Dispatched with Royal Mail 2nd Class. Beautiful Multi-coloured Tie Dye Scarf. Waffle Scarf. Dispatched with Royal Mail 2nd class. Stretchy ruched fabric. Multicoloured pink, blue, purple, cream,black, blue.. Tassels. Super soft feel. 10” x 68” plus fringe. Joules Scarf Womens Navy Multi Pattern. Condition is Used and care label removed for aesthetics. In good condition and barely used. Dispatched with Royal Mail 2nd Class signed for. CREW CLOTHING LADIES LARGE SCARF/WRAP. Condition is Used. From a smoke and pet free home. Beautiful colours, slight snags/pulls but it doesn't detract from the look when wearing the scarf. Please see photos. Dispatched with Royal Mail 2nd Class. U.K. Buyers only please. Thank you for looking. This is a pretty, good quality silk scarf by Echo. A beautiful scarf in black / off white / blush pink colours with Star design, from a previous season of the French Captain Tortue brand. Pretty pink fringe trim. Bang on trend and great for Spring / Summer! Patterned 100% Cashmere pashmina scarf in multi colours, reversible. Wear with the stripes showing or reverse to plain cream with colorful pattern on both sides. Beautiful sheen to this scarf. 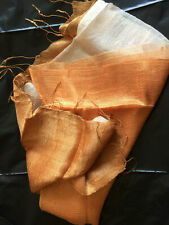 Top quality Pure Silk Georgette Scarf produced in China. An exceptional, eye-catching multi-coloured Aztec Tribal print. Apart from wearing as a traditional scarf, it has a multitude of other uses. Lovarzi Colourful Women's Scarf Black Glittery Tassels Hippie Boho BNWT Bargain! High quality scarf. Stand out from the crowd with this vibrant scarf. Scarf looks stunning as it has thin lurex shining silver stripes. Currently on Amazon for £11.99 Grab a bargain! Viscose & Silk blend, velvet scarf with screen printed Stripe & Spot design. Designed by Stuart Morris Textiles. Vince Camuto Scarf, new, never worn but no tags. Gorgeous pink and grey colours. Vince Camuto Scarf, new, never worn but no tags. Gorgeous pink and grey colours. Dry clean indicated on label. Generous size of 140x140. Large Lightweight Bright & Bold Red Multi Coloured Butterfly Scarf 70" x 43"
Multi Coloured Butterfly Design. Bright & Bold Colours. Pretty Lightweight Scarf 18” by 62 ”. Ideal for All Seasons. Multi colour leaves will go with lots of outfits. GUDRUN SJODEN WANJA FLORAL PATTERNED SCARF/SHAWL. A lovely, colourful scarf covered in a bright and cheerful floral print. Made from a light and airy cotton gauze, crinkled for added texture. Size: 200 x 50cm. CLAUDE CAT MULTICOLOURED SCARF. Wonderful wide-eyed cat faces adorn this fabulously quirky scarf.Purrfect accessory. WE HAVE PRODUCED OUR OWN WEBSITE AND SUCCESSFULLY ATTENDED A NUMBER OF FABULOUSLY AMAZING GIFT FAIRS. Handwoven Thai Silk and Cotton Tartan Check Plaid Scarf. 7 Multicolour designs. Black, Grey multi coloured Scarf/Pashmina in such a lovely Print. Black border with rich colours of Winter. Beautiful design and soft against the skin. Rectangle in shape and oversized. Modern looking with soft touch. Good for all seasons. Best accessory for office looking. Condition is New with tags. UK stock. Dispatched with Royal Mail 2nd Class. Wine/Berry, Black, Grey multi coloured Scarf/Pashmina in such a lovely Print. Wine/Berry border with rich colours of Winter. Beautiful design and soft against the skin. Rectangle in shape and oversized. BEAUTIFUL LARGE AZTEC WINTER SCARF. GORGEOUS SCARF PRICED TO CLEAR. Oversized Scarf, Boho Scarf, Large Warm Hippie Blanket, Festival wrap, Throw. Multi-coloured rectangular scarves make for colourful and fashionable additions to your wardrobe. Designed with a bold pattern, these multi-coloured scarves are great for helping you express your personal sense of style. They have an easy-to-wear design and can be wound around your neck in different ways, keeping you feeling cosy and bundled up wherever you go. Available in different lengths, rectangular scarves can be worn in many different ways, making them a highly versatile option. Thanks to their easy to match colour, blue scarves will match seamlessly with your wardrobe. 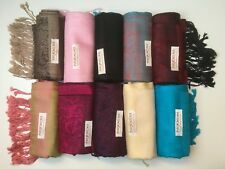 They are a highly popular choice and come in a wide selection of shades, ranging from pale to dark blue, ensuring that you'll find your new favourite scarf no matter the occasion. Available in neutral hues, ivory scarves will easily fit into your wardrobe. With elegant designs, they are the ideal accent pieces for completing any outfit. Thanks to their insulating fabric, lambswool blend scarves are great for staying bundled up and warm throughout the winter. Lambswool blend scarves are made from stretchy materials for added ease of movement and their insulating fabric is quick-drying, making them great low-maintenance accessories. With a luxurious design, lace scarves will add a hint of sophistication to your look. They have a delicate appearance, adding a subtle accent to any ensemble. Hip scarves have an exotic appearance, bringing unique charm to your scarf collection. With a decorative design, they will instantly complement any look. Designed to keep you warm, ponchos will be great for bundling up when you're feeling a little cold. They have a fashionable design, keeping you up-to-date with the latest trends.